Save time by scheduling your appointment online at Meineke.com, or visit one of our 900 locations. Contact your local Meineke for information about financing options, fleet repair, after-market warranty repair and factory scheduled maintenance. I took my car to the Meineke shop in Madison TN and was told that my car needed one thing repaired. When that repair was completed got my car home and now it's not running good , took it back and now they told me something else needs to be replaced, which was working fine before I took my car to them. After they repaired that problem, same thing happened again when I got my car home. Another issue that was working fine before I took it to them. I finally got tired of them breaking other parts on my car to keep getting money out of me. And the manager there just kept on telling me that because I had Ana older car that these things happen! Lies! I even took my newer model car there for brake repaired and it took three times to get it almost right, still hear some noise when stopping! I needed new catalytic converters installed on my truck. I bought all OEM parts online and was going to do the job myself, but ran out time due to an upcoming vacation. I called all around town and had prices ranging from $200 to $238. When I called Meineke Car Care Center on Fowler Street in Fort Myers, FL. I was told $120 to $160 depending if they encountered any problems. When I picked my truck up I was utterly shocked to hear the bill was $315.40! That's double what I was quoted!! I spoke with the manager and he actually complimented me on the quality of the parts I brought in, so apparently there were no issues with the installation. Yet, he would not come off the price at all. I also noticed that they charged me tax on both the parts and labor. As I mentioned above I supplied my own OEM parts. They only thing they supplied was $17.63 worth of "shop supplies". I understand being charged tax on the shop supplies, but questioned the tax on labor and parts that they didn't supply. I was told "it's in their system like that and they can't change it". I've been to many shops over the years and have never been charged tax on labor or parts that I purchased myself elsewhere. On a side note... Another customer overheard our discussion and told me this was his 3rd time bringing his car back to Meineke to have the same repair done to his vehicle and they have yet to fix it correctly! The San Pedro location is the best auto service around! These guys are friendly, personable, and know their stuff. I was able to do warranty work with them through my carrier. I was moving, and they got my vehicle in and out in a day! Plus, they set me up with a moving truck and transportation trailer on site! And the price was so affordable!!! I would recommend this location over and over. I wasn't paid to write a review. I actually signed up onto an account so that I could show them my appreciation. Genuine employees who aren't trying to rip you off. This world needs more of these type of people. Thanks Meineke on San Pedro! Martin and Carlos are the best! Oil change regularly. They dont push you tou get lots of needless work done, as do many "quick change" service centers. friendly and helpful.This is one of the great values.I was very pleased with the overall experience.I recommend this place. good service. Please do not go here. these guys are the biggest rip off artists on the planet. My wife took her car in for an oil change. It took about 2 hours. She also came home with a new exhaust leak and these guys were good enough to give her a diagnosis and quote for the mystery exhaust leak. The quote was for around 480 dollars. The diagnosis was that the exhaust manifold bolts had broken off in the block and could not be replaced without drilling and re tapping the block. 400$ of the estimate. the other 80 was for the bolts that can be found at any hardware store for less than 10$. So I climbed under the car to take a look. Low and behold there were two bolts that had the heads broken off. I reached up and removed these hand threaded bolts by hand in less than 30 seconds. Drilling and tapping the block huh. took the two bolts out and inspected them crazy enough the cuts lined up perfectly. So they created a problem to try and trick my wife into unnecessary repairs. don't go here. We had truck issues while traveling and pulled in at 7:45 am. The mechanics were very courteous and we appreciated their efficient work. Never, since we bought our truck on repokar com, we were not so enthusiastic about the service we got. My wife gets a coupon in the mail that says Oil Change for $19.99, but when she gets there it is $40 after labor, tax, and disposal fees. What the flip??? How do you not include labor and disposal fees in your price, and how does that double the cost? BAIT AND SWITCH advertising. I'd avoid out of principle!! I find it rather strange that I am looking for a place to do a couple minor things on mysSUV and I read the ratings for Meineke & the only 5 stars they got was from women & the rest were 1star with horrible horror stories to go along with it were from men!! Was does that say?? Me being a woman myself I still am leaning more towards the not a good idea to go there opposed to yes I'll go ahead & make an appt!! What the heck is wrong with this picture!? Just saying!! Tried to pull one over my wife, just cause she's a woman. They didn't want to give her the 19.99 oil change. She drives a 4 cylinder toyota,one of the cheapest to do. Will never go back. NEVER AGAIN!! I took my heavy duty work truck in because it had been leaking brake fluid. I own my own business and everyday this truck is out of service I lose money. The starting quote was $186.00 and 4 hours labor for pads and shoes for the rear brakes. I was told the work would only take 1 day. After 2 days of calling about the vehicle I learned they didn't have the right tool at the shop to take off the hubs, they were going to "borrow" it. I was told by the owner BOB parts have been ordered and the next day they would start working on it. That evening BOB called and said he couldn't get the parts and it would be cheaper and faster if I started looking myself. The next day we went to Meineke picked up the drum went to the parts store, bought the drum and a seal that was supposed to be ordered 3 days previous by him. They told us what part we needed and we bought the part ourselves. Took the drum back to Meineke and it ended up being the wrong size. I had to take the drum back to the parts store and the seal because it wasn't needed. Then I went to the junk yard bought the correct size drum took it back to Meineke. I was told everything should be put back togeather in a few hours. I finally called them at 5:55 (they close at 6:00) to see if it was done. I was told it was put back togeather, but they were looking for pads for the front brakes because it was leaking brake fluid. I TOOK MY VEHICLE IN BECAUSE IT WAS LEAKING BRAKE FLUID!!! I told them I no longer wanted them to work on my vehicle, they hadn't fixed what I had taken it in for. A long story short the owner BOB blamed me for the wear on the drum and it was my fault the hubs were so hard to take off. He wrote me a letter stating, "I asked for my vehicle back before he could do a thorough inspection and he had ran out of time." During this we squabbled over the price, he wanted $630.00. I told him that wasnt the original estimate and I did all the running around and bought my own parts. We agreed on $540.41. It took 5 days longer than I was told and the leak is still not fixed. I will be taking my vehicle somewhere else and I will NEVER go back to Meineke!!!!!!!!!! Run like a hungry lion is chasing you! Please read! I took my car to Meineke's because of a noise coming from back of my car. David ( The owner) and the office manger seemed nice until I understood why they have that smiley face! My car needed new brake pads, new rotors in the rear and new calipers in the front. The starting quote was $1100! after half an hour negotiating he agreed to do the job for $880. I rented car and left my car at their shop for the night. I was shocked with the repair cost, so I started looking at the prices of my parts, guess what? the total price for those part was only $200! I called him first thing in the morning and asked him to tell me how much he was charging me for the labor, he said $200. So, He was charging me $680 for the parts!!!! He refused to show me the receipt for the parts ( other shops let you know what the cost is for your parts) and he said I am a socialist! Mechanics are supposed to charge you for the labor (which is not cheap) and a little more for purchasing your parts, but not %500!!! I canceled my repair and I had to pay him $250 for doing absolutely nothing. He has worked in different dealerships for 25 years and has a dealership attitude (charging as much as possible). He has no ethics! Do your research before getting robbed like me! I fixed the car for $300 elsewhere. From the charming gentleman at the front counter(Billy) to the knowledgeable Manager (John), this was by far the best auto repair experience I have ever had. They never made me feel like I was a stupid girl. They spoke to me just as they did every customer I watched them interact with. The work was priced competitively and they even stayed a little late so I could get my car back after hours. I would recommend them to own grandma! I have to say the service was great. The mechanics were wonderful they even took me out to show me what I needed. I will come back again. Wheel hub cost from dealer $369 their price $499.99 part that they used I could have got for $205.## @ the store across the street. Or 269.00 at a store down the road. Way over priced part. The labor is also as high union employee d of which they are not. I went to Meineke to get an alignment done on my 2001 Dodge Ram 4x4. I expected it to cost upwards of $100-$130. 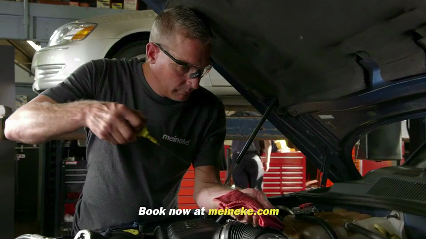 I called around and Meineke was the least expensive place in town at only $79.95. I scheduled an appointment and they told me it would be roughly an hour to get the alignment done. 35 minutes later I was out the door spending no more than the quoted $79.95 (No tax?! :D) They even warned me about a few other issues with the truck that I was unaware of before coming in, but they didn't pressure me to take care of the problem and pour money into their company that I didn't have. They gave me a safe time frame on when to get the other issues fixed, and the gentleman even took me in the shop and SHOWED me the problems, as opposed to most places that will tell you everything is wrong with your vehicle and fix it, then charge you $1000 when you expected to only get an alignment. I will DEFINITELY go back, and recommend them to all my friends and family. I am extremely satisfied, and the trucks alignment is working amazingly. Honest with superior repairs and guarantee!